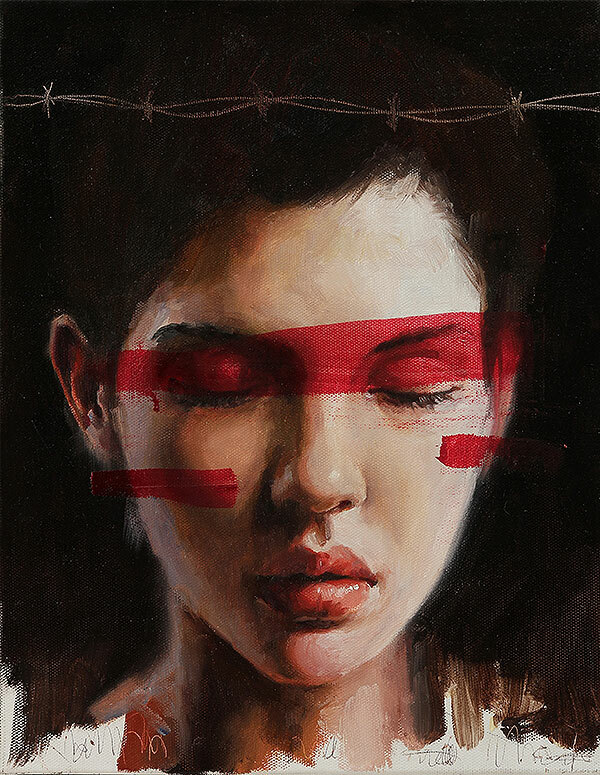 Adam Caldwell’s latest exhibition ‘Dark Stage’ opened at Thinkspace Gallery, Saturday, July 20th and is on view through August 13th. The exhibition is a collection of works created in collaboration with the Bandelion Dance Troupe. 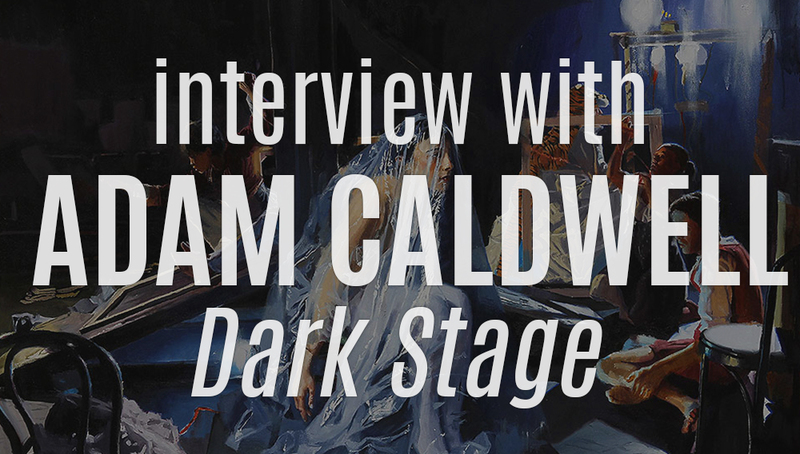 In our interview with Adam Caldwell for ‘Dark Stage’, we dive deeper into the collaboration and his creative process. SH: You share the inspiration for the show was you were, “looking for a way to imply and illustrate multiple levels of artifice and meaning. 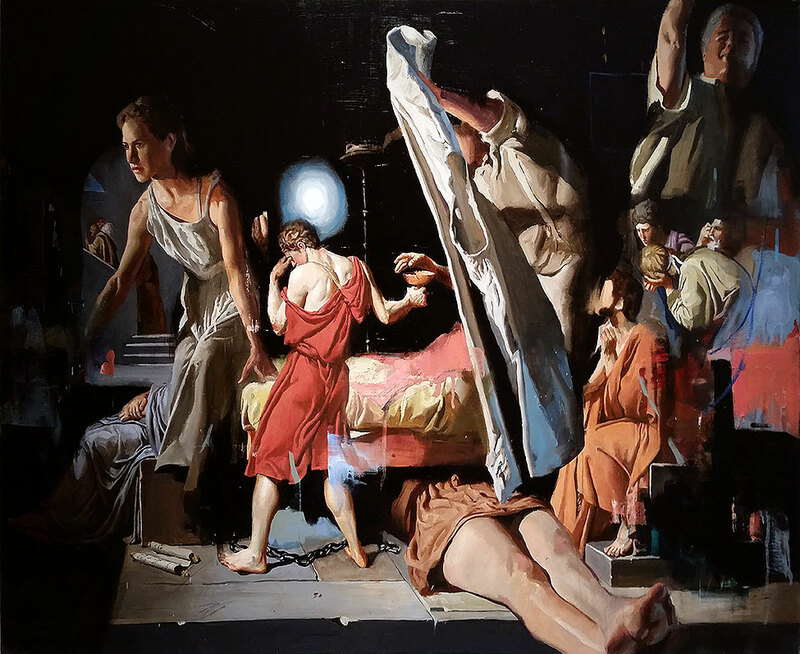 In fiction there are many examples of plays within plays, stories within stories, I wanted to explore that in painting.” Was there a singular moment that stirred that idea or was is a collection of realizations? Do you have a catalyst moment? AC: It was a collection of various stories. The primary source is the writings of Jorge Luis Borges. His stories include fictitious authors, references to non-existent books, stories about stories, levels within fiction that ultimately imply our level of being readers outside the story. SH: How did you become introduced to the Bandelion Dance Troupe? AC: I contacted many theater groups in the bay area and Bandelion was one of the first to contact me. I met the director Eric Kuypers and we understood each other right away. I was very lucky. SH: Was there an aspect to this latest body of work and collaboration that surprised you? A difficulty you weren’t expecting? 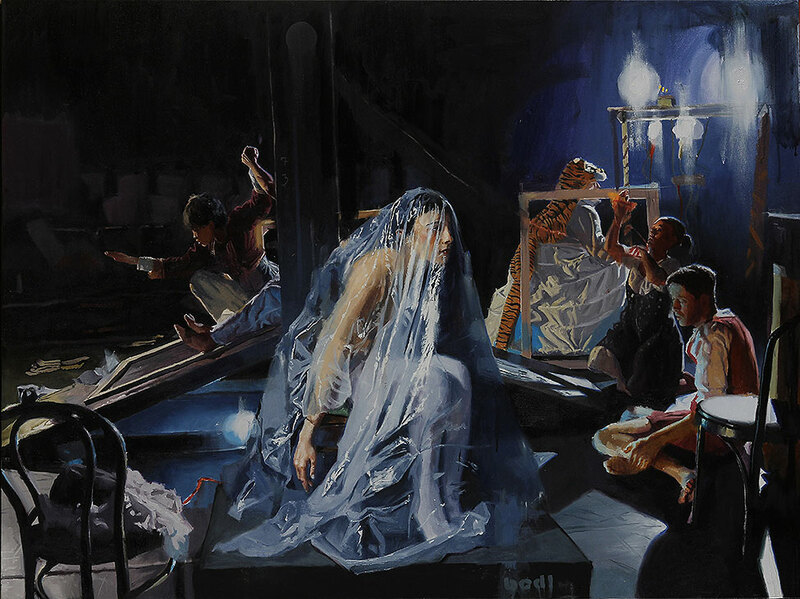 AC: Initially, I had thought of actually writing a play and having the group do a sort of dress rehearsal that would then be used as a basis for paintings, but as we collaborated it became clear that an improvisational performance yielded greater opportunity for interesting figurative compositions. SH: This collaboration took place over a few years, how did you coordinate it and would you tell other artists who may be intimidated by collaboration? AC: Its been a lot of work to get everything together, but getting out of the studio and into the larger artistic community is a great way to break boundaries and get fresh inspiration. It’s crazy but I just asked and a lot of companies were interested immediately. SH: What is one of your favorite plays? AC: I love “Rosencrantz and Guildenstern are Dead” by Tom Stoppard. It’s about two minor characters in Hamlet hanging around behind the scenes of the play and trying to figure out their roles and why they are there. SH: You described the work as Caravaggio meets David Lynch, what Caravaggio painting do you think should inspire a David Lynch film? 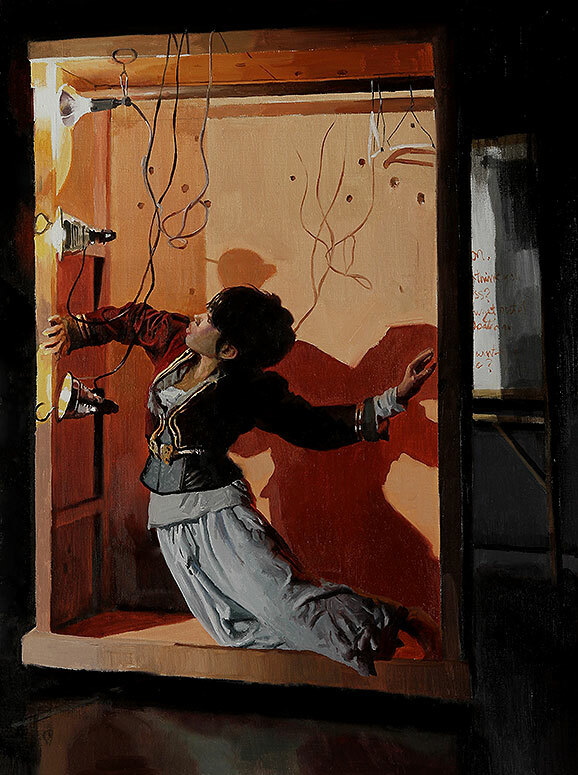 AC: Any of the larger figurative works where there are multiple figures arranged in a tableaux. I guess it has the lighting of a Caravaggio and the weird action of a Lynch scene. SH: What does an awesome day in the studio look like? AC: Lots of paint getting onto the canvas. SH: What makes you return to the easel after a really awful day in the studio? AC: Music, other people’s art, my teachers, the weight of the whole tradition behind me. SH: What are a few of your favorite tools of the trade; paints, brushes, canvases? AC: I love linen, new brushes, charcoal. SH: As an artist, when looking at other artists work, what moves you and excites you? What shows are you anticipating? AC: I respond to work that is careful and then impulsive, and merges the two in a new way. I am looking forward to new Adrian Gehnie, Justin Mortimer, Alex Kanevsky.